More than 90,000 homes and businesses in some of the smaller towns and villages across Derbyshire now have access to faster download speeds, thanks to the county council’s fibre broadband partnership with BT. One of the areas to benefit recently is Bakewell. 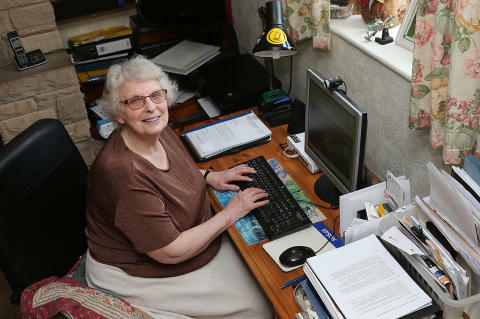 And 79-year-old local resident Pat Lunn, who’s involved in a number of community groups and is Chair of the Neighbourhood Planning Team, is already making full use of the technology and has high hopes for the future. Pat, who’s lived in Bakewell for 47 years, said: “I’m not as mobile as I used to be so I spend a lot more time at home now. By having a fast and reliable internet connection I can still attend community meetings through video using Skype and keep up-to-date with what’s happening in the area. It would be easy at times to feel isolated at home but fibre broadband helps me stay involved in community life. Derbyshire County Council’s Cabinet Member for Highways, Transport and Infrastructure Councillor Dean Collins, said: “Using the internet has become part of everyday life for most of us. But Derbyshire’s rural nature meant many areas were left behind when commercial operators rolled out broadband services. Recently published research from BT shows the internet is breathing new life into local communities with more than 80 per cent highlighting the internet’s importance in enabling involvement in their local community and providing access to information and services such as playgroups, social activities and other amenities. Furthermore, 70 per cent of respondents use the internet to access local businesses and services, providing a boost for local business owners. Other key findings include that almost half of the survey respondents (48 per cent) believe a lack of internet access leads to isolation. And almost two thirds (63 per cent) said that access to the internet empowers them to gain new experiences. And Pat’s even found new hobbies using the internet. “In my spare time I enjoy researching my family history. It’s surprising how much you can find out – my mother’s family were in the cutlery industry in Sheffield, and my paternal grandmother’s family farmed in the Cotswolds – and I’ve tracked down long-distance relatives too. If you’re a member of a parish council or community group and would like to find out more about the programme and how it could benefit local residents and businesses contact the county council’s broadband engagement officer at Kerry.bailey@derbyshire.gov.uk or visit www.digitalderbyshire.org.uk.